The first Watts moved to Vine House Farm in Lincolnshire in 1883, and the family has been there ever since. 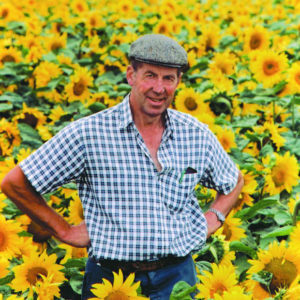 Four generations on, the farm is run by Nicholas Watts and his daughters, as well as a team of six other staff, all of whose fathers worked on the farm. A keen bird enthusiast, Nicholas has for many years been managing the farm in ways best suited to improving wildlife habitat and biodiversity. Shocked at what modern agriculture was doing to bird populations, Nicholas has been monitoring and improving the situation on his land since the early 1990’s, planting spinneys, widening dykes, putting up nest boxes and generally managing crops with wildlife in mind. Barn owls, reed buntings, warblers, skylarks and meadow pipits are just some of the species that have benefited from the improvements, and his work has been so successful that the RSPB now promotes some of his ideas nationally. As well as courgettes, beans, sweetcorn, various brassicas and potatoes, Nicholas also supplies us and many others with bird seed. Born organically out of his passion for wildlife, the bird seed business began when Nicholas decided to plant crops on setaside land for the birds to harvest. So many birds were feeding there that Nicholas opened up the land to the public, who all asked where they could buy the seed he was feeding them. And so it began. Nicholas Watts’ farm provides an excellent example of farming that has a positive impact on both the local and global environment. In 2006 he was awarded an MBE in recognition of a lifetime’s dedication to farming and conservation.